I absolutely love Frankenstein. I love that Mary Shelley wrote this at 19. 19!!! When I was 19 I was trying to navigate the halls of my new college and trying to figure out what I wanted to be when I grew up. I most definitely was not writing great literature. I think the fact that Mary Shelley wrote this stunning story at 19 makes me love the story all the more. I also really love teaching this novel to my AP Lit seniors. At first, they hate the book because it’s written in 19th century Standard British English, and my students are more about tweeting in under 146 characters. But, after we get through Walton’s letters together, they begin to see Mary Shelley’s wit and intelligence. 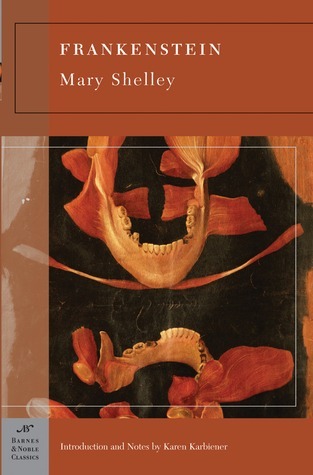 Then I start bringing in articles from current science and medical journals and show my students how everything Mary Shelley warned us about it coming to pass, and this book quickly becomes one of their favorites too. If you have never read Frankenstein before, I highly recommend the read. To say that Shelley was ahead of her time would be a gross understatement. This book is terrifying to read now because of where we are currently in scientific and medical thought and practices. Unfortunately, we are where we are today because man gave up God in order to become gods themselves. Playing God is never ok, and that is the basic premise of Shelley’s novel. Mary Shelley began writing Frankenstein when she was only nineteen. At once a Gothic thriller, a passionate romance, and a cautionary tale about the dangers of science, Frankenstein tells the story of committed science student Victor Frankenstein. Obsessed with discovering the cause of generation and life and bestowing animation upon lifeless matter, Frankenstein assembles a human being from stolen body parts but upon bringing it to life, he recoils in horror at the creatures hideousness. Tormented by isolation and loneliness, the once-innocent creature turns to evil and unleashes a campaign of murderous revenge against his creator, Frankenstein. I loved Frankenstein when I read it more than 25 years ago. I’d love to re-read it.